Containment Protocols: RPC-224 is to be contained in a simple envelope within a high security locker at Site-002. Any testing is to be done with headphones in a windowless room and monitored over cameras with muted footage. Any testing done elsewhere should be considered a Containment breach and punished accordingly. Any personnel able to hear 224 should either close their eyes or refrain from focusing on objects for longer than 5 seconds at a time until any personnel are able to terminate the sound. Description: RPC-224 is a CD of George Crumb's Makrokosmos 1 with the words “For Plato” written in cursive writing by a felt tip pen. 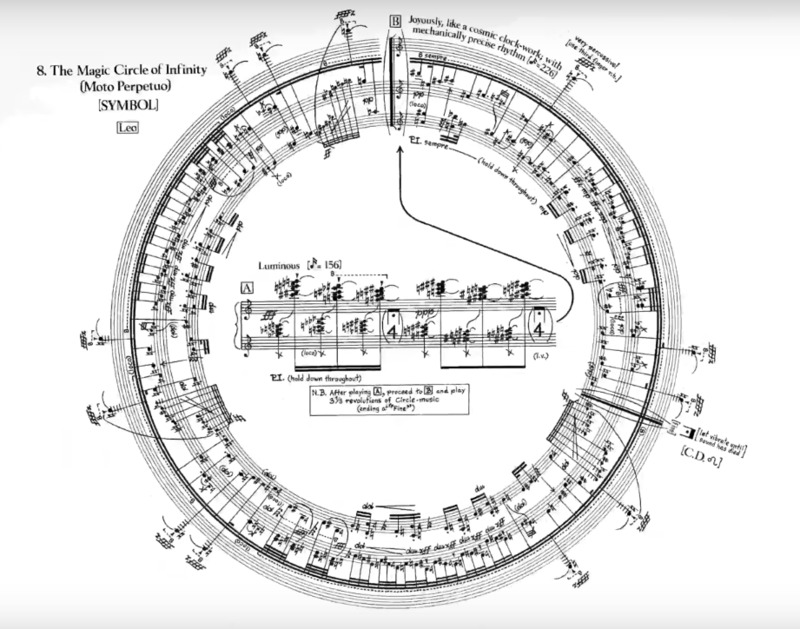 Many of the songs are jarring and atonal in nature, however the anomalous activity is only connected to Act 2 Song 8, titled "The Magic Circle of Infinity". Any subject listening to the song will start bending structures and objects after 5 seconds or more of staring. Experimentation has concluded any structure will be warped in a clockwise direction (clockwise to the listener), with thin structures warping quicker than denser structures. Thin objects like poles simply bend while structures like walls warp in a swirling motion. For a living creature, prolonged exposure (approximately 20 seconds) is required for anomalous properties to occur, with approximately 40% of subjects surviving with extreme and permanent spine damage, and approximately 60% dying after hospitalisation from internal bleeding. Once the piece starts playing, it will loop continuously until the CD is stopped. Any damage done while active is permanent, even with the disruption of the piece. Discovery: RPC-224 was originally discovered on the Greek island ████████, where local police responded to a report a violent murder on a remote part of the island1. After the police discovered 224's anomalous properties, embedded agents recovered 224, administered amnesetics to all people involved in the investigation and created a cover story of a suicide via jumping. Findings: Subject was ordered to stare at their reflection, after 20 seconds, subject bent violently sideways, and verbally exclaimed their pain for 5 minutes until they expired. Onlooking researchers then attempted to recorded their results, when suddenly their clipboards warped in a swirling motion. With fear of a Containment breach, they ended the experiment. Researchers then reviewed footage2 trying to understand what happened, which resulted in the TV warping, terminating the music along with it. It was then understood that hearing 224 in any way would result in its anomalous properties. Autopsy on the Subject revealed his spine was bent to his right, causing internal bleeding and rupturing vital organs in his chest. Experiment procedures were updated. Findings: CSD-224-2 is ordered to put on headphones playing 224 and stare at CSD-224-3. 20 seconds after CSD-224-2 put on his headphones, CSD-224-3 bent violently sideways. CSD-224-2 was distraught enough after testing concluded to attack ASF personnel, which quickly terminated him. CSD-224-3 was given immediate medical attention and survived despite physical and mental trauma. She was reassigned to handling RPC-████ due to her paralysis from the waist down. 20 seconds confirmed for human mutilation. Findings: 5 second stare is found to be enough to warp a steel wall. Different materials were then tested for the following 2 hours. All materials warped at different times, with thin walls/materials warping quickly and denser/thicker walls taking more time, with the longest time to warp an object being 2 mins. Findings: Subject was ordered to put headphones and a blindfold on. Testing concluded after 10 hrs with the Subject falling asleep. Subject was taken back to his cell with no issues and no long term affects have been noticed3. Foreword: A letter was delivered to Site-002 one day after 224 was contained. The letter was addressed to the Authority and signed by someone under the alias Schoenberg from L'Academia della vera arte4. It has come to my attention that you've recently found one of my many creations. We here at the Academy strive on creating new and exciting art for the public and experiment to push the boundaries of art forms further than anyone else dare, however I wish to ask that your officials please return my piece to where it was found. My art's effects shouldn't work on people, a disturbing and unacceptable mistake. This is an oversight that I can easily fix, and with it complete, I can release this piece into a more public area with the comfort knowing that no one is in danger. I understand if you don't comply, but if you do you will be sharing a testament to how far mankind has come from scribbling paintings in caves. And a small ask regarding the future: I implore you to allow our art to be viewed by the public. Other artists have spent years crafting some of their finest works. If any art is to be contained by your organisation, it should be the artwork of those who have malicious intent or are truly psychotic as their artworks would be created specifically to cause harm or be defective. Be on the lookout, as you always are. 4. Translated means: The Academy of True Art.